While waiting for Tony Watt to arrive for interview, there is a temptation to expect some kind of lawless wild child to walk through the door and bristle at every question asked of him. 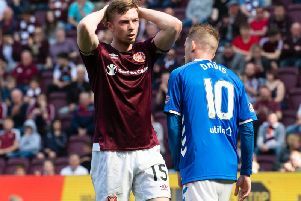 Hearts’ new striker has, after all, been cast as a minor hell-raiser with an attitude problem in the early years of what has thus far been something of a nomadic football career. The notion goes that the Tynecastle side have only been able to land a player of such talent and pedigree because he is viewed, even at the tender age of 22, as damaged goods. Watt is well aware of how he is perceived, particularly in Scotland, where he hasn’t kicked a ball at club level since starting for Neil Lennon’s Celtic in a 2-2 draw at home to Inverness Caledonian Thistle in August 2013. In conversation, however, there is little evidence that, in signing him on a season-long loan from Charlton Athletic, Hearts have brought trouble to their door. Watt acknowledges that his career hasn’t always been plain sailing, but the Coatbridge boy scoffs at the notion that he has wasted his talent so far. Having, by the age of 22, scored 30 goals in over 100 appearances for relatively big clubs in Scotland, England and Belgium, while also gaining full international recognition with Scotland as recently as four months ago, he has a case. Watt knows the only way to truly get the critics off his back is to steer clear of negative publicity and ensure he is a success at Tynecastle in the upcoming campaign. However, while acknowledging that the public haven’t yet seen “the real Tony Watt”, he offers a reasonably sound explanation for why he has been unable to generate any sustained momentum since cutting ties with Celtic – the club at which he came through the ranks and made his name – two years ago. “At Standard Liege [Watt’s first club after leaving Celtic permanently], I didn’t have a lot of chances – I only started four games,” he said. “I then went to Charlton and did well but they wanted to loan me out, I don’t know the reason behind it. I went to Cardiff on loan and they were desperate to sign me but they couldn’t because there was a transfer embargo. Then I went to Blackburn on loan and after a few games, I injured my groin. After showing fleeting glimpses of his quality last season and earning a maiden Scotland call-up in March, Watt is hopeful that returning to his homeland can help ignite a career that promised so much when he scored a Champions League winner for Celtic against Barcelona as an 18-year-old. “I am coming back to show the real me and hopefully I can do that now that I’m closer to home,” he said. “I wanted to come back and play my football close to home, I’ve not made that a secret. I wanted to be near my family so I can have a support base and people around me instead of being in London myself, with family coming up and down. “I don’t think being away from home is why my career has been stop-start. It’s just hit me in the last four or five months, because of everything that’s gone on, and because of injuring my groin, that I want to be closer to home.